The Performance DC is a complete package designed to open up the high-end listening experience to those who prefer to avoid the selection and adjustment of separate cartridges or tonearms, and who simply seek the best in music reproduction. The elegant and simple appearance of the Performance DC with its clear lines matches its excellent audio performance. In combination with the CLARIFY tonearm and the VIRTUOSO V2 moving magnet (MM) cartridge, a turntable package has been created that leaves virtually nothing to be desired. Excellent tracking properties and hyper-accurate speed synchronization ensure the ultimate listening pleasure. An infrared sensor combined with Clearaudio's optical speed control (OSC) ensures an outstanding level of speed stability – a prerequisite for optimal listening. A high-torque decoupled DC motor effortlessly rotates the precision-machined 70mm-thick platter made of high-density acrylic. The platter rotates in a virtually friction free environment atop the 15mm-thick stainless steel sub platter, thanks to Clearaudio's patented ceramic magnetic bearing (CMB). A convenient choice of three rotational speeds is also at your fingertips, and it is possible to install a second tonearm. 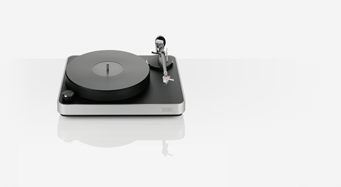 Clearaudio’s vision for the Concept: design an elegantly styled turntable package featuring a level of groundbreaking technology usually found in high-end turntables, combining plug-and-play simplicity with outstanding sound quality and affordability. Based on their love for music, Clearaudio designed an exceptional new turntable that breaks the rules and boundaries of music, reproduction. The results of their tireless passion and commitment are the outstanding Statement turntables and the Statement TT1 tangential tonearm, designed to reproduce music from vinyl records at the highest possible level. Clearaudio's newest turntable is one of the most gorgeous designs ever built by the famed German analog perfectionists. The Ovation not only looks stunning, it sounds staggering. In addition, it’s simple to set up and play. A 1.5-inch Delrin platter sits on a plinth made from a composite of aluminum and wood laminate that looks as great as it is effective at controlling vibration. A DC motor locks in perfect speed control, giving the Ovation an indescribable naturalness. It all just sounds “right.” The design of the Ovation seems both timeless and minimalist- maximum music enjoyment needs no embellishment.